How Safe is Your Company Data in the Cloud? For this blog article we are lucky to have Chris Gregory. Chris is the nbn Local Manager for SA/NT and in this article he talks about the NBN effect and how it will benefit your business. Connectivity is set to spur up to 80,000 new businesses by 2021. New businesses, jobs and productivity via the nbn™ broadband access network projected to boost Australia’s GDP by up to $10.4 billion. Australia is in the grip of a nation-wide digital transformation with new research revealing the “nbn™ effect” is projected to contribute to the creation of up to 80,000 new businesses by 2021. Commissioned by NBN Co and conducted by data analytics and economic firm AlphaBeta, the Connecting Australia report is the nation’s first social and economic study into the impact of the nbn™ broadband access network. The research shows the growth of new businesses in regions connected to the nbn™ access network accelerated at twice the pace of the national average with up to 5400 additional new businesses created in 2017. Launch of nbn’s Business Operations Centre, the ‘nerve centre’ of our customer service and support initiatives for business customers. With a dedicated team of more than 100 service experts, this operations centre will be the ‘one-stop shop’ to support the needs of business end customers migrating to and using the nbn™ access network. With four million end-user premises now activated on the nbn™ broadband access network, now is a great time to take a look at how Australians are using our network. Real-time entertainment usage: Typically the vast majority of traffic demand on NBN Co’s networks comes from live streaming, web browsing and tunneling (usually via virtual private network technology for the purposes of security); end users on HFC / FTTN / FTTP networks all had very similar usage demands, particularly on higher speed plans. Fixed Line access technology patterns: fixed Line technology choice is not having a great impact on end-user demand today, but that we must continue to ensure flexibility in the capacity management of the network to meet the demands of the future. For this blog article we are lucky to have Chris Gregory. Chris is the nbn Local Manager for SA/NT and in this article he talks about the NBN and how it will benefit your business. Whether you just need basic internet access, or you’re planning a business-wide digital strategy, an nbn™ powered plan is needed for your connectivity. As you know, the nbn™ broadband access network is being rolled out area by area. As each area becomes ready for service, affected services will have up to an 18-month window – your ‘ready for service’ window – before they are disconnected, so it’s important you switch affected services before your disconnection date, even if you only use a landline phone. And always remember – the nbn™ access network is a wholesale only network. Your phone and internet providers on-sell nbn™ powered plans to you. Whether you just need basic internet access, or you’re planning a business-wide digital strategy, an nbn™ powered plan is fundamental. The role the nbn™ access network plays in your digital future will largely depend on the size of your business. You’ll also need to consider the degree to which your data speeds and connectivity options affect the experience of your customers—as well as the interactive applications you use, such as video conferencing, 24/7 e-commerce applications and a wide variety of cloud-based services. Better connectivity opens up new opportunities for your business and can transform the way you interact with customers and suppliers. More information & support on nbn™ access network for small and medium business, visit here. For residential users, the switch to the nbn™ access network is relatively straight forward. 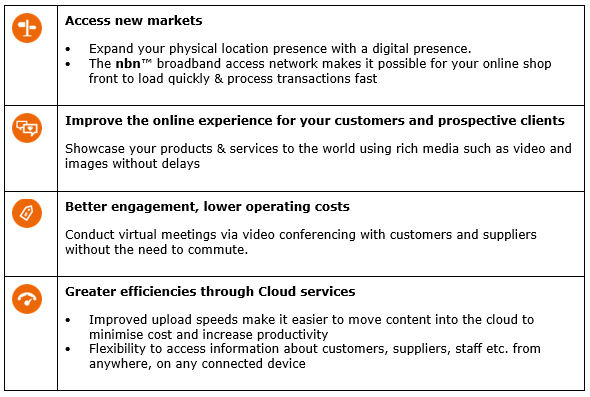 However, business users will have a range of options to consider—including switching to a solution on the nbn™ access network and/or looking at other connectivity options in the market. When a phone and internet provider develops business (and residential) plans using the nbn™ access network, those plans are constructed from two basic wholesale ingredients—the first of which is a Traffic Class, the second, a Service Level Agreement (SLA) between nbn and the provider. nbn offers three Traffic Classes that vary in capability, performance and priority at a wholesale level. For your business, this is all about quality of service options. By combining different wholesale Traffic Classes with optional enhanced SLAs between providers, businesses can choose from a variety of connectivity plans to suit their specific needs. It all depends on what is available to you, what works for you, and how you decide to integrate the nbn™ access network into your business. You’re probably familiar with Service Level Agreements (SLAs), which cover fault rectification, when it’s available and how long it takes to resolve. For fault trouble tickets raised between 8am and 5pm on business days, the Standard Service Level for all nbn™ services available to phone and internet providers applies (see table below). If your business has critical data needs, we recommend you speak with your phone and internet provider about having enhanced Service Level Agreements (eSLAs) in place with nbn in relation to your bundle or package. This means nbn will provide a higher level of support to your provider, who in turn should be able to provide a higher level of support to you. The right questions to ask your phone and internet provider: make sure the plans your phone and internet provider suggest are the right size for your business’ data needs. You may find that for some low-priority business services, a plan based on the residential ‘best effort’ service quality plus an eSLA in place between nbn and your provider meets your needs. While for voice services, you might look at a plan based on a higher quality of service option, which are designed to primarily support voice communication. 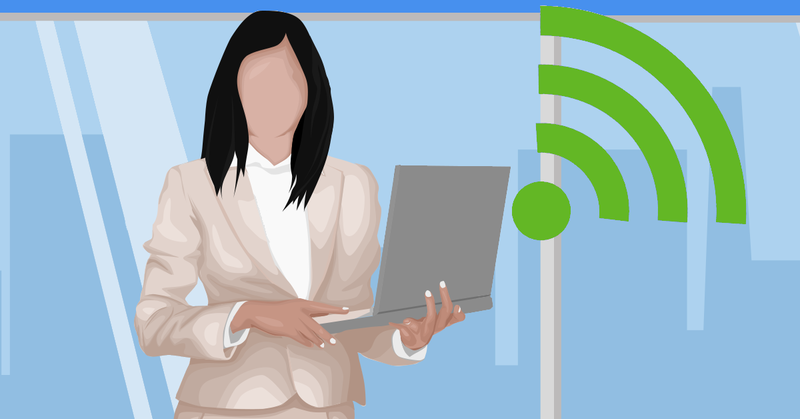 Does Your Office Need Business-Grade WiFi? In today’s business world, having great WiFi isn’t a luxury – it is a necessity. 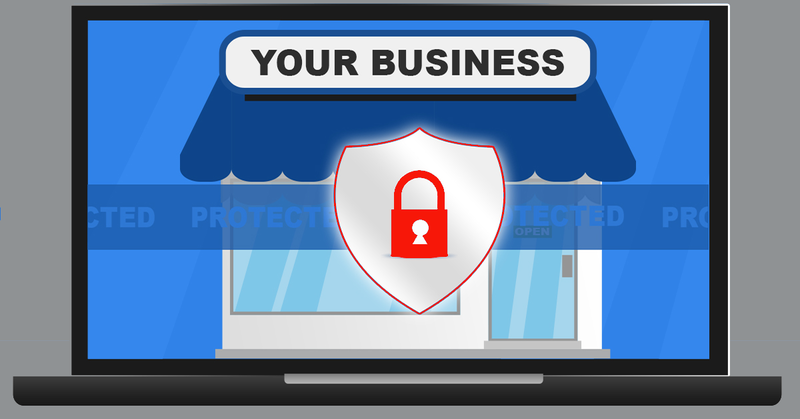 For some small businesses, consumer grade WiFi may be sufficient (especially if it is not widely used), but with the explosion is usage of mobile devices many find that business-grade WiFi is more appropriate. As companies grow, there becomes a tipping point where business-grade is necessary. So how do you know if your business is ready for business-grade WiFi? Ask yourself the following questions to find out. How many devices use your Wireless Network? It used to be that a few laptops connected to your WiFi network, but that is no longer the case. With the rise of portable devices such as smartphones, tablets and other devices each person may be connected to your wireless network from several devices. Consumer-grade hardware is designed for just a few people (ie the small amount that typically live in a single household) but can not manage larger amounts of users and all of their devices. This is especially true for sustained concurrent usage. Remember that your employees aren’t the only people who expect to be able to connect to your WiFi. One of the first things visitors and customers typically do is look for a WiFi network to connect their smartphones to. What is the size and area of your workspace? The number of access points you will need for your business is dependent on the amount of physical space that needs to be covered, the shape of the area, wall material and the number of users / devices. In smaller spaces, consumer-grade WiFi may be good enough. Larger, oddly shaped spaces benefit from business-grade. If your building’s walls are made of brick, cinder blocks, or cement, you likely need more access points than buildings made of other materials. Make sure you have a strong connection from all locations. It is annoying to only be connected to wireless in certain areas of a building and find yourself in a deadzone one step later. Access points for business-grade WiFi tend to be more powerful and flexible. For example, some business WiFi systems can move Wi-Fi devices from a crowded access point to one that is less busy. By doing this, everyones access remains consistent. If you foresee your range needing to increase, such as renting out more space, it is much easier to add more access points to a business-grade network than consumer-grade one. Businesses that anticipate scaling up soon are better off with business-grade WiFi. Do you want guests to have the same quality Wi-Fi as workers? In households, where consumer-grade WiFi hardware is used, all users share the wireless network equally. 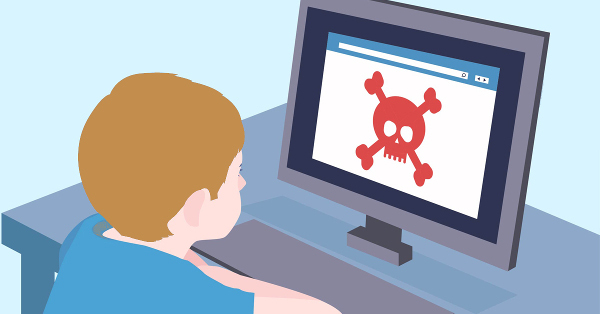 In a home environment, if children are slowing down the internet with Netflix or video games, it is not a big problem. However, a choked business WiFi can cause a lot of problems. Business-grade WiFi allows you proper network management. You can assign a designated amount of bandwidth to different users so they are unable to clog the entire connection. You can also allow visitors internet access without giving them unlimited access to your local network. How much does the internet affect your employees’ productivity? For some companies, workers only use WiFi for a few quick tasks. With these types of businesses, if the internet is slow, it won’t have a big impact on how much work your employees get done and consumer-grade wireless might be a good choice. For other companies where there isn’t much people can do if the WiFi isn’t working well then a business grade connection is essential. WiFi troubles can also lead to frustrated and unhappy workers. Strong WiFi is a necessity for all businesses. This is especially true for larger businesses that connect a lot of devices (from both an employees and visitors perspective) and have a large work area. Also for those where employee productivity depends on a strong connection. The goal is to keep your business-critical technology running smoothly. Consider carefully whether consumer-grade Wi-Fi or business-grade Wi-Fi is the best choice for your business. When you ask yourself the questions above, the answer should become clear. If you are in Adelaide, South Australia and your business’s wireless network is struggling then give us a call on (08) 8326 4364 or via email at support@dpcomputing.com.au to discuss a solution. 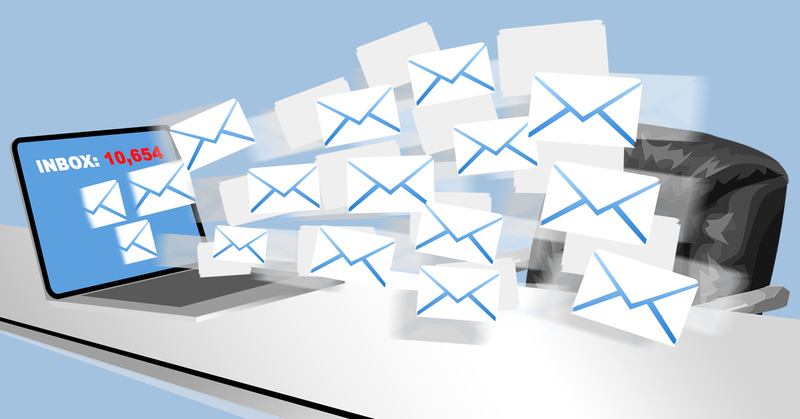 Are You Struggling with Email Overload? While email is a great business tool that has allowed near instantaneous communications with people around the world it can also lead to problems. 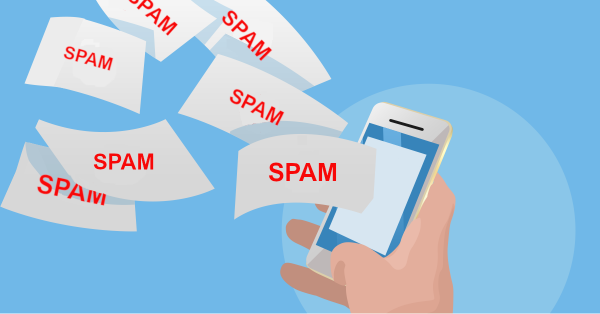 Many people now receive dozens or even hundreds of emails in a day and at times it can seem like you are wasting your entire day dealing with all those incoming messages. You can quickly become overloaded with emails and the amount of emails also makes finding important messages harder. So how can we deal with this overload? The first step is to reduce the number of emails you receive and there are a few ways to do this. Restrict who you give you email address to: It is important to think carefully about who you give your email address to. For example, if you enter a lot of contests, this often automatically subscribes you to their email campaigns and / or adds you to a spam list. If you type your email into every popup box asking for it, these add up. Reduce who you give your email to. Unsubscribe: If you haven’t opened one of those newsletter emails in months, go through and unsubscribe. Turn off notifications from social networks such as Facebook, Twitter and Pinterest. If you like emails from these networks, then adjust the settings so they email you the highlights once a day or week rather than allowing them to spam your inbox several times per day. Do you need that notification? If you receive emails that contain information you can find elsewhere, switch those emails off. eg. you might run an e-commerce site that sends an email for every sale. If your website already has a record of this, you don’t need those notifications doubled up. If you really need that notification or email then create a rule to move it into a different folder and thus not clog up your general inbox. Change your email habits: Change your own email sending habits. 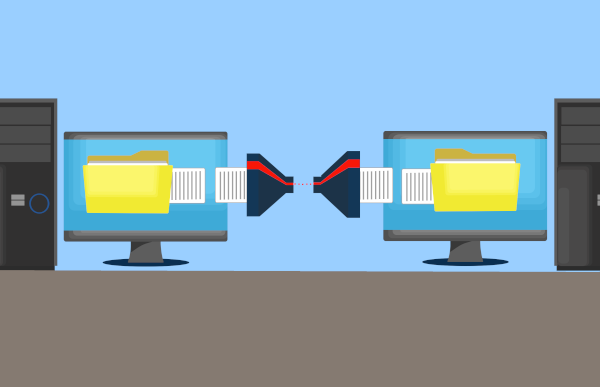 If a topic is complex and will require a lot of back and forth conversation, consider discussing it in person, over the phone or via one of the new online collaborative tools like MS Teams. Sending fewer emails will reduce how many you receive and remember that you don’t need to respond to every email you receive. Resist sending unnecessary messages: Stop the urge to send messages with a single word like “Thanks!” or “Ok” and you will notice others will stop sending you similar, unnecessary messages. When sending group emails, you can also remind others not to use “reply all” unless the information is relevant to the entire group. Start cleaning up: Start emptying out your inbox now and get rid of any old emails you don’t need to keep. Delete old calendar invites, advertisements or any emails where the problem has been resolved. Respond to any messages that can be answered as soon as you can. Move everything that is left until you have a completely empty inbox. Archive messages where you don’t need to take an action, but you think might be useful. You can search and find these later if necessary. Put other emails into folders based off of the type of email and the priority level. From now on, try and automate things via rules. You can have receipts automatically go into a receipt folder, calendar invites into another, etc. A cluttered inbox can lead to your mind feeling just as cluttered.. Free up your inbox to free up your mind and create more time in your day-to-day life. Follow these steps and let email overload become a thing of the past. If you need help with your emails, give us a call on 08 8326 4364 or via email at support@dpcomputing.com.au. Is A Slow Network Hindering Your Business? Few things in life are as intensely frustrating as slow network speeds. Whether accessing shared files, a database or trying to print, waiting for things to happen seem to take an eternity. Worse still, this extra time can keep both clients and staff waiting and get in the way of business productivity. Every time you save or retrieve files from another computer or network storage device, data is transferred across the network. Depending on your setup, data can fly over the network or trickle between machines. Poor network speeds are often the bottleneck that slows down the entire IT system. If a slow and unreliable network sounds like your office setup then there are many available solutions available where we can help. Offices often maintain networking hardware that is as old as the premises they are in or the businesses themselves and have been left in place long after their suggested expiration date. If it is not broken then don’t fix it commonly rules as long as some working connection, however slow, still remains. Even when the rest of the network is capable of ultra-high speeds, a single bad component or cable can bring the entire network to a slow crawl. Even peripheral devices throughout the network can cause traffic to slow. A badly installed device can send out an overwhelming number of messages that spoils other network traffic. Often just one or two small upgrades is all that is needed to unlock the full speed potential of the network. Some users equate a slow network to slow internet. Moving to a fast Internet speed often can fix this issue. For some businesses, installing a dedicated server is an ideal solution that can balance the IT workload. Access to shared resources on a single device often benefits the entire organization by eliminating redundancy. A network server is purpose built with efficiency and reliability in mind to keep your business running at full capacity. By pooling resources for everyone to use, work is evenly shared and centrally available to prevent bottlenecks in the system. Reduced network loads, improved efficiency, and faster transfer speeds mean that higher productivity becomes the new normal. Moving resources to the cloud can work for many businesses too. Where high speed, low-cost internet services are available, moving your work online can be a highly cost-effective solution. Software packages such as Xero, Quickbooks and MYOB offer finance and accounting packages operating in the cloud. Suites such as Microsoft Office offers services for creating and sharing documents through cloud resources. Both packages eliminate the need for many of the network operations that we use every day. For many applications such as Quickbooks huge databases sometimes gigabytes in size are required. It is these types of applications where the advantage of the cloud becomes clear. To use this locally, a super fast network and server are needed where as in the Cloud this is all handled by the software provider and only require a simple web page interface for each user. Instantly, looking up finances and editing documents becomes as simple as checking your email. With services moved to the cloud, purchase cost and maintenance of expensive local network hardware are reduced too. A complete network solution that works to make the most out of all the available resources is unique to every business. Only a tailored solution to address your network needs will increase your productivity. If you are located in Adelaide, South Australia and your IT is starting to get in the way of your business and your network is running too slow, give us call at 08 8326 4364 and we will see what we can do.